Hello, again fellow jewelry lovers! As jewelers ourselves, the Crystal Cabin family has a deep love and affection for finely carved Haida jewelry. We work with local Haida carvers and jewelers throughout the year to cultivate and select some of Haida Gwaii's most beautiful collection of Haida jewelry. To share our knowledge of these intricate pieces and the craftsmanship that goes into them, we thought it would be helpful to dedicate a blog to the topic of Haida jewelry. We often get questions about how to care for jewelry, whether it be silver, gold, copper, or argillite. It’s important to stay informed about the type of metal or stone you are wearing in order to preserve and care for it properly. Since Haida-carved silver jewelry is particularly popular for its look and craftsmanship, we thought we’d start with that first. Before you care for your piece you may spend time pondering which style is right for you. There are so many options to consider depending on if you want a ring, necklace, bracelet or pair of earrings. There is a difference in the type of crest you’ve chosen as well. Would you like to symbolize your love by wearing a Hummingbird? Your own bravery with a Wolf, or curiosity of the Raven? Each Haida animal carries its own traits that you can relate to and create a connection with. Doing so will make your selection more meaningful and carry a story for you to tell. After choosing a design, the details of your piece will then come down to accent materials such as abalone, mother of pearl, precious gemstones, such as emerald, diamond, sapphire, etc., and other complimenting metals, such as gold on silver or silver with copper accents. The materials used in our jewelry is authentic and worked on by established and respected carvers and jewelers. All silver jewelry is sterling silver. Some carvers and jewelers also create a blackened, or antique look by oxidizing sterling silver jewelry. This can be done by exposing silver to oxygen in a pressurized environment for a long period of time or by using professional products made especially for jewelry darkening. This look is sought-after because the blackened effect can create additional depth and contrast between the carving lines. This look can also be achieved by wearing your jewelry and allowing your body's natural oils and the air to oxidize the jewelry. Overtime this can create a blackened and antique look. To preserve the oxidized look, do not clean your jewelry using an ultrasonic cleaner, polishing cloths, or other polishing techniques. 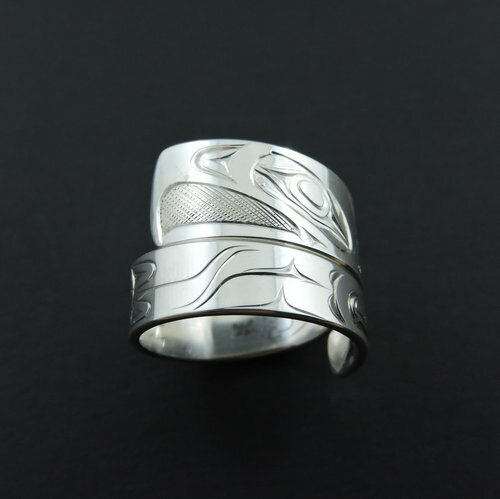 Rings are a great choice for a variety of occasions, such as engagements, weddings, anniversaries, birthdays, or a special reminder of Haida Gwaii. When selecting your ring, please specify your ring size. Crystal Cabin will have your ring custom-carved to fit your ring size. To determine your ring size, please consult this easy to use ring-sizing guide. *Crystal Cabin tip: Did you know that wrap rings can be easily adjusted to fit most ring sizes? This flexibility in sizing makes this style of ring an ideal gift for yourself or others. Silver Eagle Wrap Ring. Wrap rings can be easily adjusted to fit most ring sizes. Pendants are a universally loved form of Haida silver-carved jewelry. When selecting a pendant, you want to look for a piece that has a durable bail. The bail, which is located on the back or top part of the pendant, is the piece of the pendant that hangs on a chain or lacing. You want to look for a bail that is large enough to fit your chain. When selecting a chain for your pendant, it is important to use a chain of the same material. If the metal of the pendant is different from the metal of the chain, the harder metal could overtime wear away the softer metal. Crystal Cabin also offers a selection of silver, gold and copper chains that can be matched to your pendant and preference for thickness, length and link type. *Crystal Cabin tip: We also do chain repairs! Please email us or give us a call ahead of time to consult about a broken chain. For those who prefer to keep their sterling silver looking bright and shiny, your silver jewelry can easily be gently treated with a soft polishing cloth or for an even brighter clean, an ultrasonic cleaner. We use an ultrasonic cleaner to treat the silver piece with a professional polishing solution. This cleans the first layer of oxidation before the polishing cloth is used to detail the smaller areas that are harder to reach. To minimize oxidation you can use small plastic bags to separate your jewelry and keep it in a controlled environment, as the air around us and even the natural oils from our skin can affect the jewelry. If you have any more questions don’t hesitate to contact us by email at info@crystalcabingallery.com or give us a call at 1-250-557-4383. SGaana Gaahlandaay haanuu dii kiiGa ga. My name is SGaana Gaahlandaay (Spirit of the Killerwhale). Wagyen Yaatsxaayda kihl gii Alix. And my English name is Alix. Kayhll ‘Laanas Ts’aahl ad uu kiigawa ga. I come from the Kayhll ‘Laanas Ts’aahl clan.